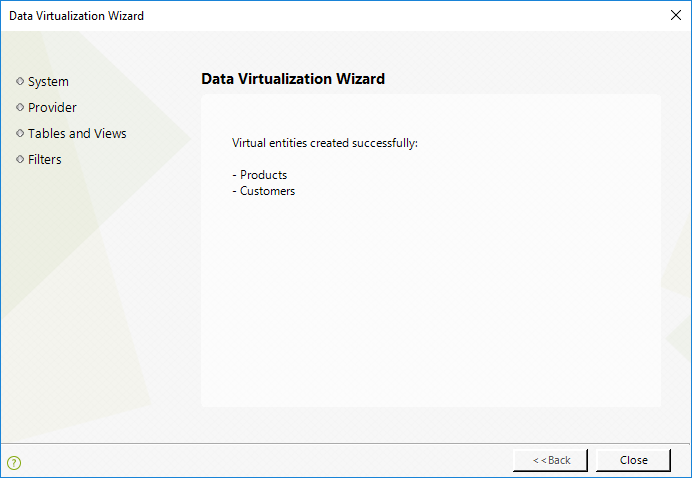 Bizagi presents a Virtualization Wizard to assist you in connecting to an external SQL Server or Oracle database ( and the necessary components for the connection is created by default). View more information about Virtualization. The following article illustrates how to configure Virtualization in Bizagi by using the Wizard. 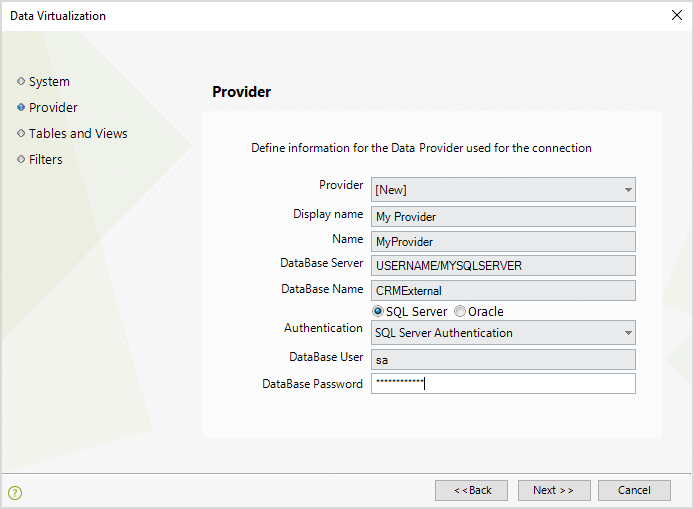 If you need to connect to an external data source which is not in a SQL Server or Oracle database, refer to Using advanced Virtualization configuration. 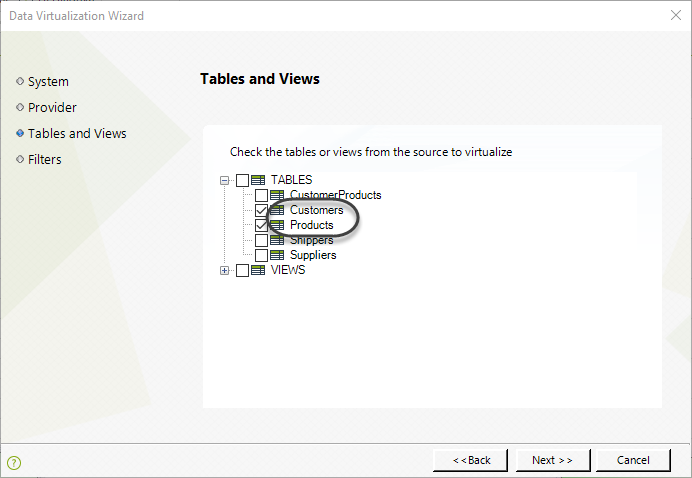 To launch the Virtualization Wizard, go to the second step of the Process Wizard in Bizagi Studio (Model data). 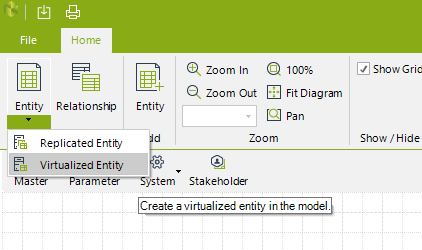 While designing the Process data model, you are given the option to include virtualized entities in the Diagram that will be created as Master-type entities. 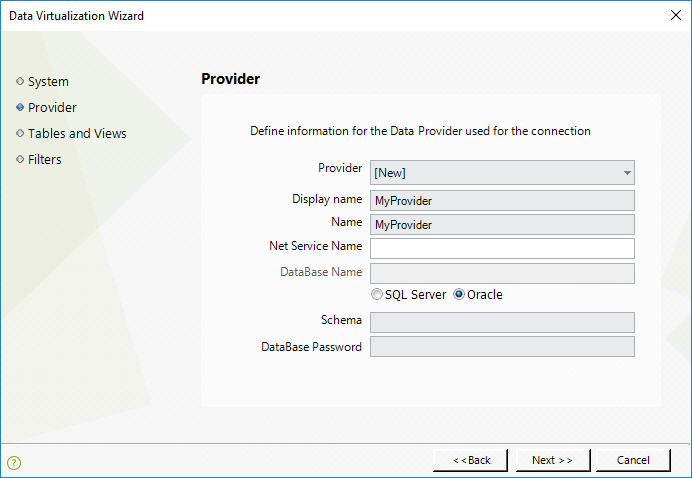 Before using the Virtualization Wizard, it is recommended to review the set of supported data types for Bizagi's built-in connection to SQL Server or Oracle databases. 1. Defining the information for the system where the external data source is. This is done to set and manage the external system as a referenced system in Bizagi's project. 2. Entering the details for the Data Provider. The connectivity information that specifies where the external data is stored. 3. Selecting which tables or views to virtualize. 4. 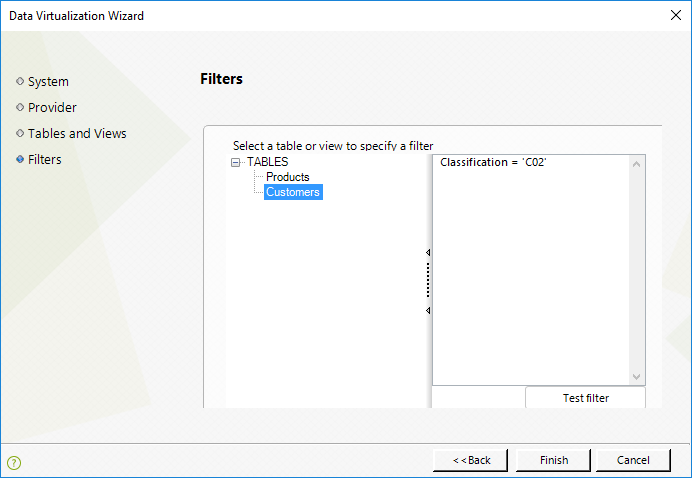 Defining optional filters for the tables or views to virtualize. Once the configuration is complete, we also run an initial import for these tables or views, so that we can verify that the integration was properly set (checkpoint). 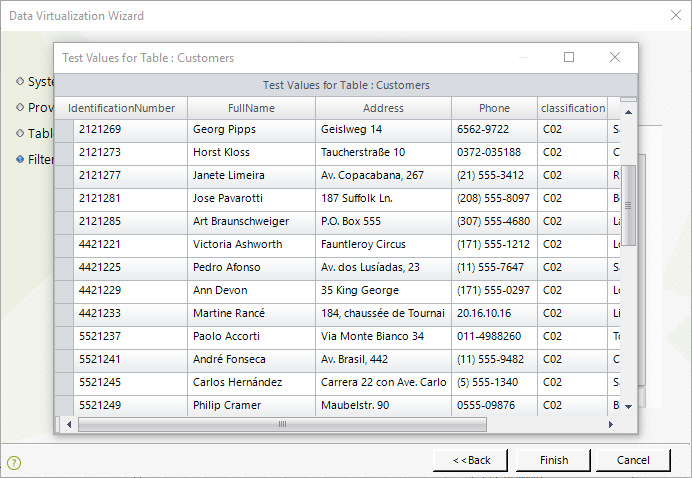 In the following example, we will virtualize the following tables from a SQL Server database: Customer and Product. Both of these tables will be automatically created in Bizagi as Master Entities. To illustrate this configuration, we will part launch the Virtualize Entities Wizard from the Process Model diagram presented in the Data Model step. 1. Define the information for the system where the external data source is. In the System window, Select New from the Select System drop-down list. 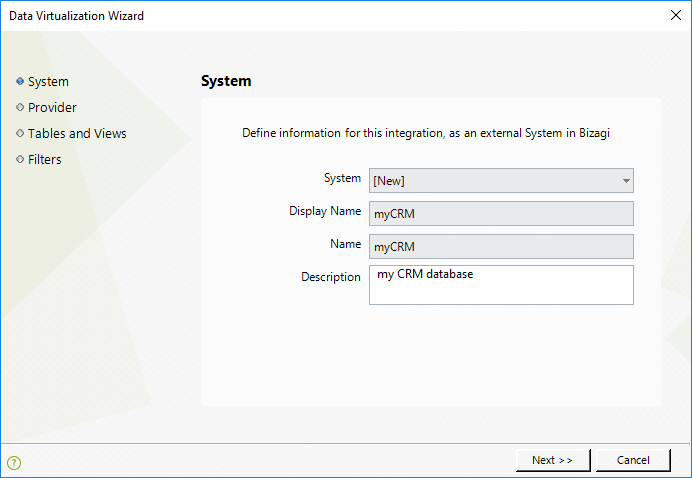 Enter a reference name (System Name) to the external system. This reference will represent the external system in your Bizagi project. In subsequent Virtualization settings, you will have the option of choosing existing systems (configured previously) from the Select System drop-down list. Enter the Display Name and Description, and Click Next. Notice you should also input detail for this new system: System Name, Display Name, and Description. In subsequent Virtualization configurations, you may choose in this drop-down an existing System (configured previously). 2. Enter details for the Data Provider. In the Provider window, select New from the Select Provider drop-down list. In subsequent Virtualization settings, you will have the option of choosing existing systems (configured previously) from the Select System drop-down list. Enter the Provider Name, which must be a unique name you will give to this specific Data Provider (needed when you register more than one external data source in your project). Select if your external data source is in SQL Server or Oracle. •Database Server: The name of the Database Server containing the SQL Server instance. •Database Name: The name of the Database where the tables or views to replicate are. •Database User: A login account to access that Database. Note that this account requires read access to the tables or views for replication. •Database Password: The password for the specified Database User. •Net Service Name: The connection string to your Oracle instance's service. This is specified as "databaseServer:port/serviceName". Notice that the default port for Oracle instances is usually 1521. •Schema: The name of the user schema. •Database Password: The password for the specified Schema. In subsequent Virtualization configurations, you may choose an existing Data Provider from the drop-down list (configured previously). 3. Select which tables or views to virtualize. 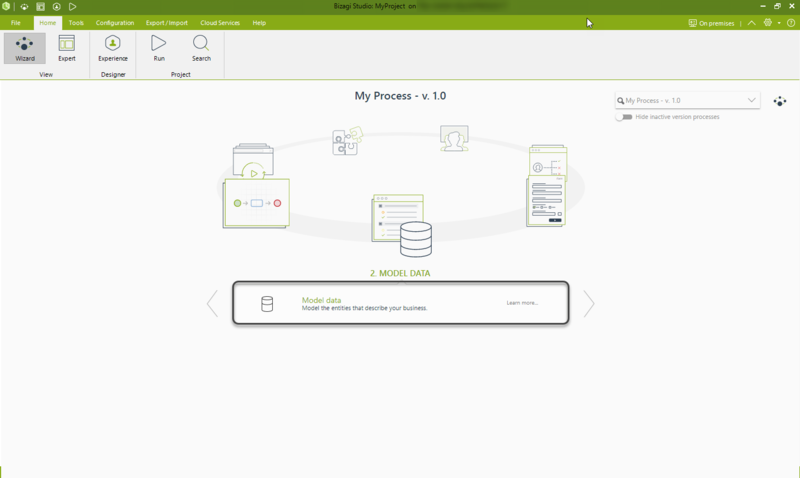 Once you have defined the connection details to your external data source, Bizagi will search and show the available tables and views at the source. Expand the TABLES node to display a list of tables on the external data source, and mark the table(s) to virtualize. In our example, we will mark the Customers and Products. 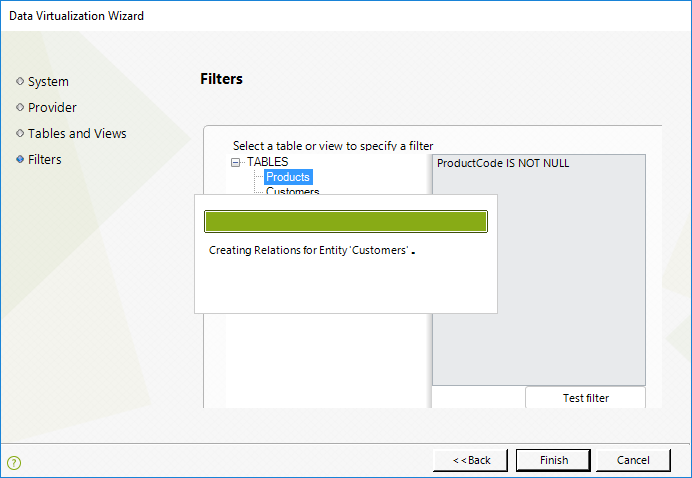 When selecting more than 1 table or view, Bizagi will automatically create their relationship (reference attributes), if these tables have an existing relationship explicitly defined at the source. 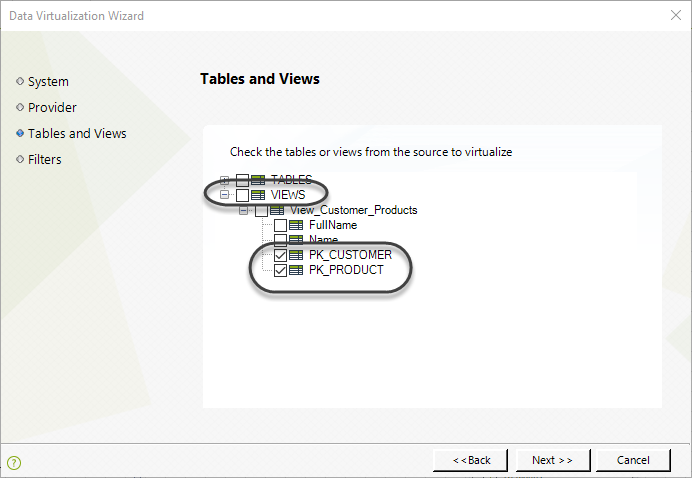 When selecting a view for Data Virtualization, you do not need to mark that view, but to make sure you select which column or columns will make up the business key definition (those which define uniquely each record in it). 4. Define filters for the tables or views (optional). As an optional step, and applicable when running your processes in a .NET platform, once you have selected the tables or views to virtualize, you may choose to define if there is a filter so that Bizagi disregards certain records. For example, you may set that you want to disregard Customers with a certain type of Classification code. If you do, you may test this filter by using the Test filter button. Take into account that this option should be used carefully when having a really large number of records in the source, as querying and retrieving these values could take up some time. The least number of active connections to the source database is the best strategy to make sure optimum performance. Bizagi will create the entities, and the necessary configuration components. Click Close when this configuration has been successfully completed. Once Virtualization is set, you may choose to verify that it properly synchronizes the Master Entities with the external tables. Take into account that with Virtualization, Processes in Bizagi access information stored across multiple data sources in execution time (run-time). This functionality is transparent to end users in the Work Portal; therefore you need to verify that Virtualization is working correctly. This is done by checking that the Activity's form in your Processes use information from virtualized entities. In addition to this, explicitly check that the values are being synchronized with the source, you may choose to see these values displayed in specific entities through the Entities module (available for the Development environment). To view how to verify that the Virtualization was set up correctly or is running properly, refer to Verifying Virtualization.